Instead of getting to our taxes I'm sharing this little soup with you. Not entirely a wise choice but infinitely more appetizing. Many times I spy something in a cookbook or magazine that sounds exceptionally good. Though I might tweak it a bit to our own liking, the "bones" of the recipe remain intact. Or... I completely go off on my own tangent... slicing, dicing, mixing, and simmering until it tastes like what I'm after. This particular soup is more of the tangent-variety. It came about in the middle of the produce section at the market, after realizing that I had once again left my detailed list at home. 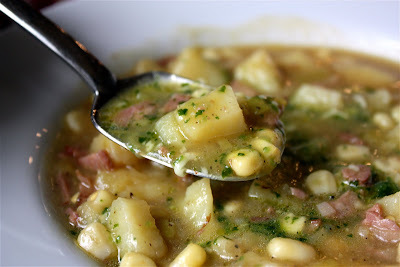 Scanning the selection of produce, I remembered a corn and potato chowder that was featured on a cooking show I'd seen. So, yes, I guess I initially "spied" it, but it veered dramatically from that initial thought. That particular recipe called for both flour and cream, neither of which I wanted to use and both of which are fairly common in chowders (and the reason I steer clear). I do, however, like the thought of a chowder... its chunky, hearty, warm-you-to-the-bones nature. 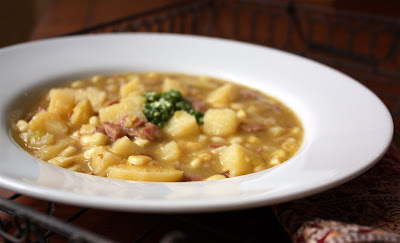 I figured a good pop of potatoes would release enough starch to give this soup the oomph it needed to qualify as a "chowder" and deliver that characteristic comforting satisfaction. The other part of pulling this chowder together was coming up with something that would give it a fresh pop... chowders can be a little boring without a little pop of heat or freshness (just my opinion). I immediately thought of jalapeños, thinking I could mince them up and cook them along with some onion, or such, to get the base started. Then I spied cilantro... and the whole picture came together. And the good news is that the chowder turned out great. It was just thick enough to adequately be called a chowder -- tasty with a start of sautéed leeks and turkey bacon to get the broth going; satisfying with generous bites of diced potatoes that are cooked through just until they have that perfect toothy goodness without getting overly mushy; and nicely balanced in texture with a subtle crunch of white corn. Then... there's the pesto. A dollop atop a steaming bowl of this chowder melts and melds into the broth giving each spoonful a perfect little pop of fresh, zesty flavor. I can now only hope our taxes come together with the same ease and satisfaction. 1. Heat olive oil in a heavy pot over medium high heat. Add in turkey bacon and sliced leeks; sauté until leeks are soft and bacon is cooked through, about 5 to 7 minutes. 2. Add broth and potatoes to leek mixture; reduce heat to a low simmer and continue cooking for another 10 to 15 minutes, just until potatoes can be pierced through with a fork with some give (not mushy), adding corn to mixture after first 5 minutes or so of simmering. 3. While soup simmers, drop jalapeños, garlic, cilantro and parmesan into a food processor and pulse until combined. Stream in olive oil and process until desired consistency is achieved. Add salt and pepper, to taste. 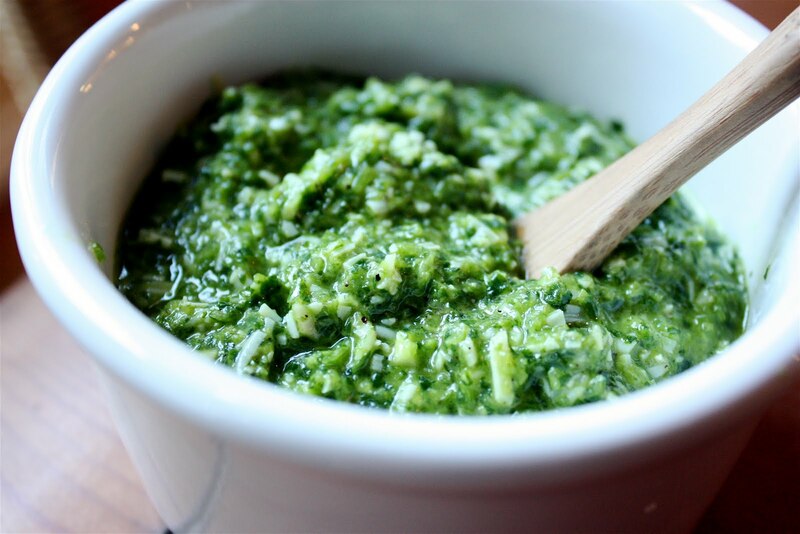 Spoon pesto into a bowl and pour a thin layer of olive oil on top; cover with plastic wrap and place in fridge. 4. When chowder is done (potatoes test firm but cooked through), ladle into bowls and dollop with a spoonful of pesto. Serve immediately. Note: You should have plenty of pesto to carry over to other meals/nibbles... a dollop on grilled salmon? spooned onto nachos? Mixed into pasta?